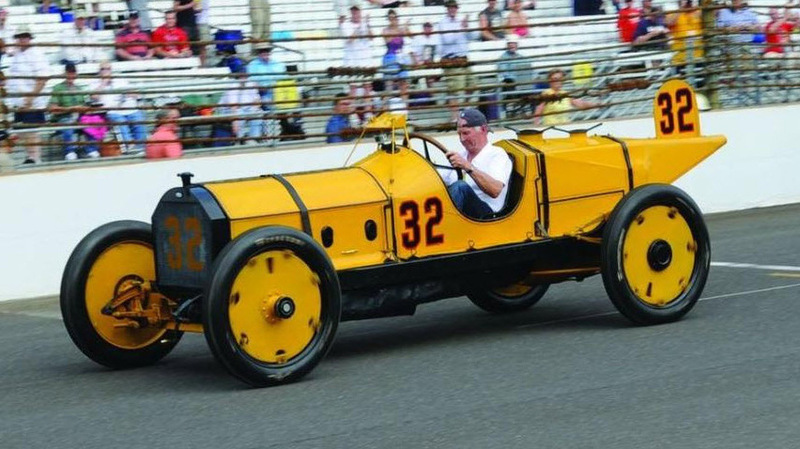 David Traver Adolphus has written a follow-up article in Hemmings Daily on the condition of the Marmon Wasp following the 2011 Indy 500 parade lap. For obvious reasons it wasn’t widely publicized, but Parnelli Jones blew up the Marmon Wasp last year. Ray Harroun drove the car to victory at the Indy 500 in 1911 and for the 100th anniversary, IndyCar champ Jones was tapped for parade laps. Unfortunately, the Wasp apparently threw a rod through the side of the crankcase. 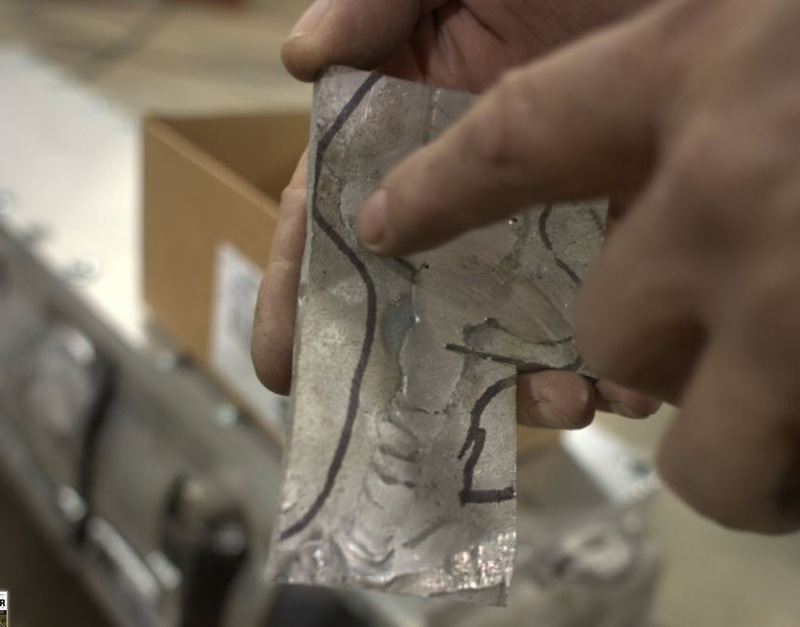 The Indianapolis Motor Speedway Hall of Fame Museum, which owns the car, found someone who attempted to repair the damage, but their welding attempts just made it worse – thermal shock formed a spiderweb of cracks next to almost every weld. After that, they turned to the court of last resort, Steve Babinsky’s famed Automotive Restorations in Lebanon, New Jersey (not to be confused with Kent Bain’s Automotive Restoration in Connecticut, another highly regarded facility). I visited Steve’s shop earlier this month, and took a look at the progress they were making. It had been held up over the summer while they competed three restorations for Pebble Beach, but they’re back on the job now. 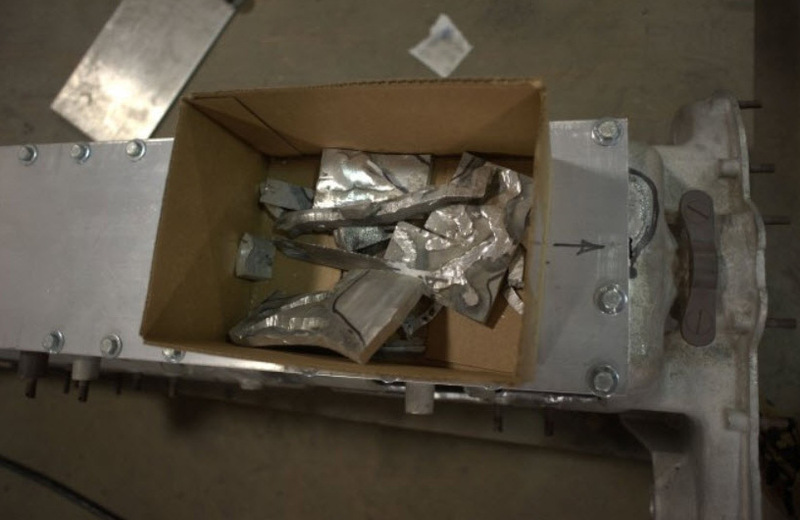 Here’s the result of botched aluminum welding: A box full of scrap metal from an irreplaceable, century-old Indy 500 winner. Actually, it’s the result of metal fatigue in a century-old bearing cap (I’d guess), but the repair attempt didn’t help any. I forgot to ask what was going to happen to these pieces, but they’d make one heck of a gift shop item at Indy. Steve points out, Magnante-style, how every weld is shadowed by a crack. You can see how that hairline extends off to the left in the 11 o’clock position. This meant that they had to cut out many very large sections. When you throw a rod, the damage isn’t confined to the exterior: There’s damage inside and out. 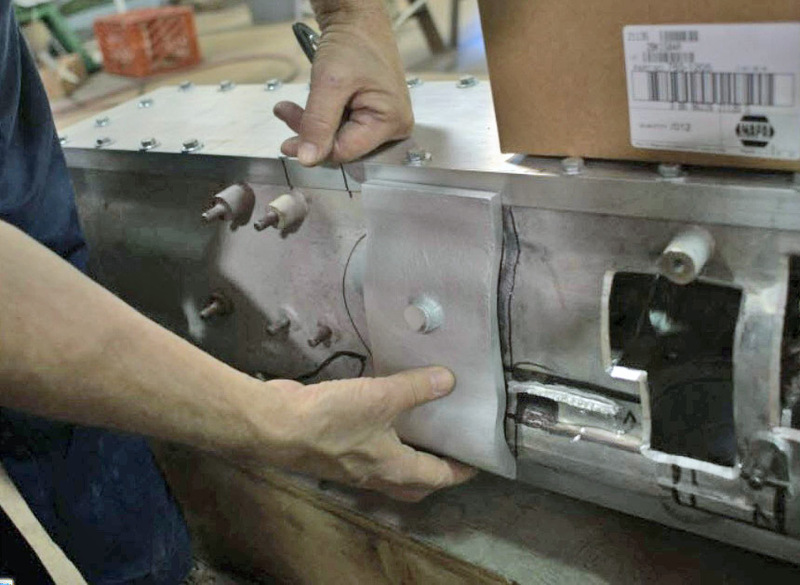 The big aluminum plate bolted onto the top is holding the crankcase together. 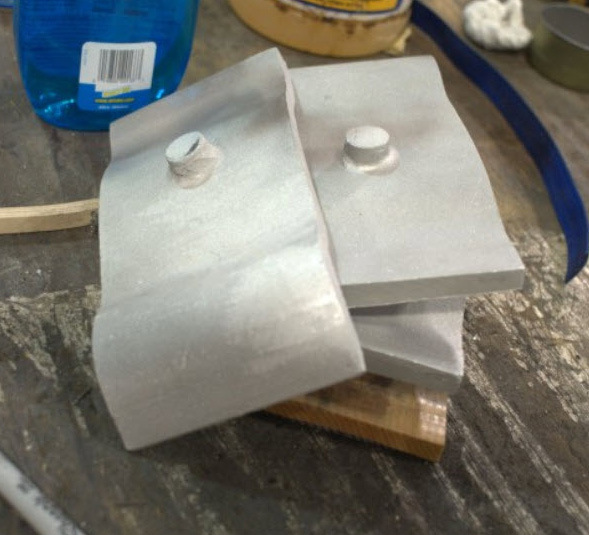 The shop has in-house forging and casting capabilities, and made these patch plates. They’re a little more substantial than the panels you’d use for your trunk floor. Steve shows how the patch plates will be affixed. You can bet there will be a little more care in the welding this time around. I’d guess the museum will need some convincing before they let another hotshoe lap it on the oval again, too. Parnelli Jones driving the Marmon Wasp at Indy, 2011. Jim Donnelly photo. It is a wonder that the block can be repaired, although i would never expect the repair to stand anything close to full throttle operation, not that it is likely to happen. The film from Bridgehampton is frightning to a current SCCA Steward. OK, that was the standard of the day, and still current in International rallies in Europe, it was just luck that there was not a major accident with spectators or with a competor hitting the “crash barriers”, aka straw bales. many thanks for posting the films. They are something special to a racer, retired. Was it really something that Parnelli did that caused the rod failure in the Marmon or just one of those things that can happen in a 100 year old engine when running? He seems to be getting the blame here. I have the 1914 Tahis Special with a 100 year old Wisconsin T Head racing engine in it. It surprises me that it seems to be difficult in this day and age to repair these old broken aluminum castings. 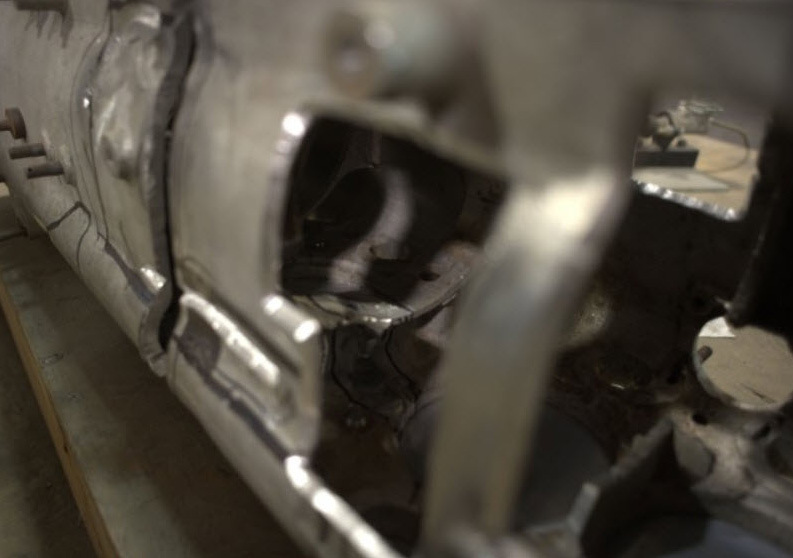 There are numerous places on my engine on both the aluminum crankcase and transmission case with evidence of weld repair done with the oxygen/acetylene gas method of welding which was the only method available in the teens. The car has participated in Vintage Racing since 1988 and has held together quite well even though never being restored. The old craftsman must have had a lot of skill.